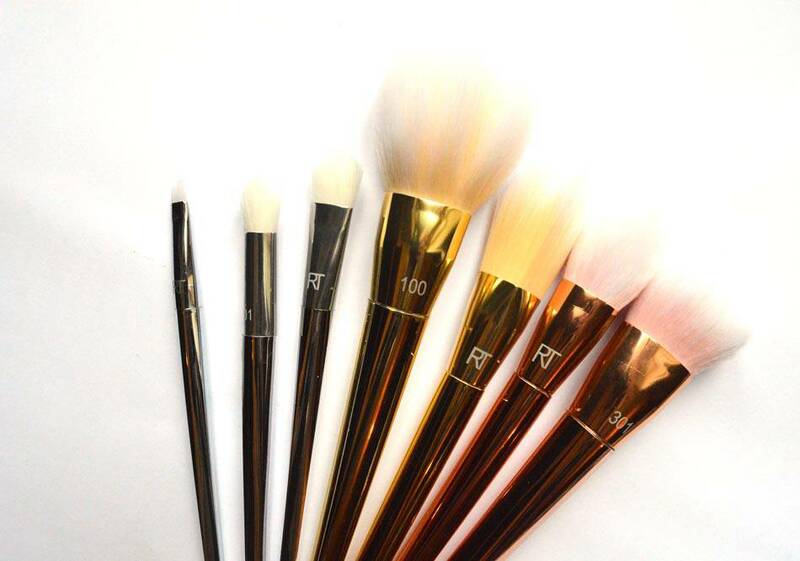 If there is anything to prove love exists at first sight it is when Makeup brushes look this beautiful. The Real Techniques Bold Metal Brushes took my heart ever since their launch but with their higher quality came an increased price for each brush compared to your standard Real Techniques brush. That said, I saved and saved and the day finally came to add the entire collection to my basket and hit ‘buy now’ as I don’t like doing things in halves. 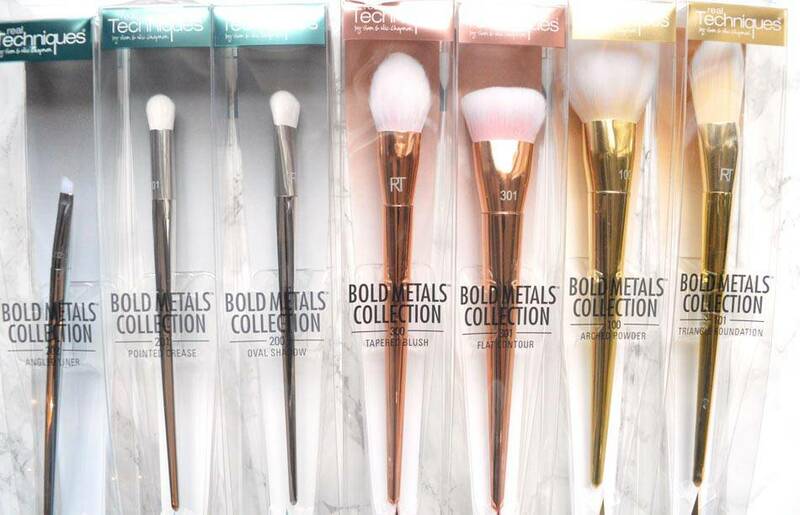 If you’re interested to see more about these premium brushes and my thoughts be sure to continue reading to see if I think they’re worth the splurge. The seven added to my collection are those from the original bold metals collection, since two others have been added but I wanted to try out the originals before going too crazy. That said, even before I used them and simply added them to my ridiculously ever-growing makeup brush collection they looked freakin’ amazing. The look is like no other brushes on the market (despite the dupes available such as the Makeup Revolution one’s I picked up here) and on my desk looked stunning, quickly becoming the stars of the show. 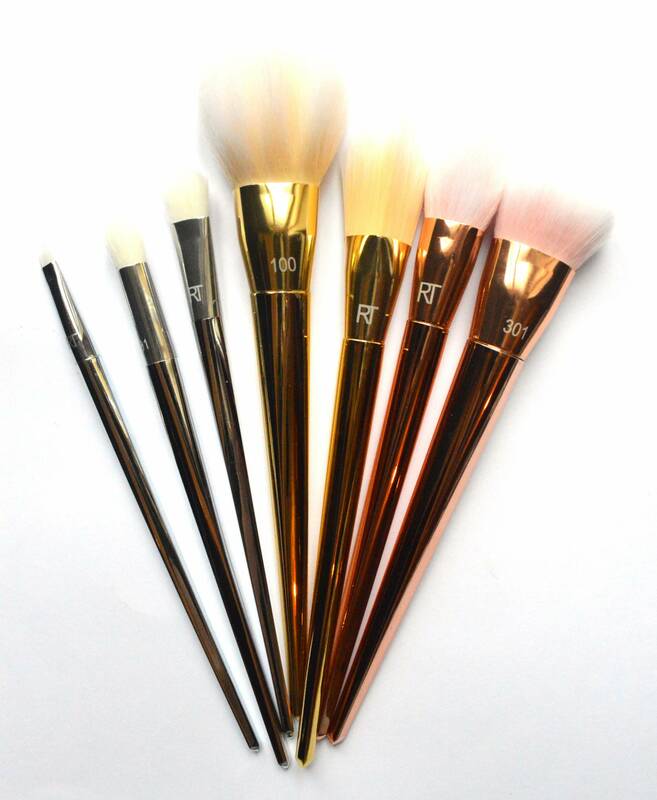 My favourite, of course, are the rose gold colour but I’m going to go into more detail about the brushes themselves, comparing them to the standard Real Technique brushes many of us own and remain to love. Like the standard RT brushes, these remain colour coded depending on their function. 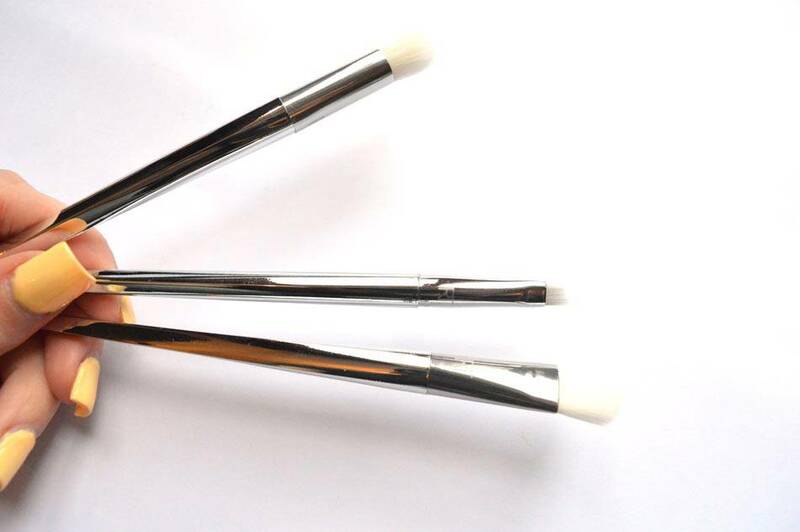 Thus, the gold stands for base brushes, this is easier to identify the brushes you need amongst a larger collection or if you work with clients doing make-up. 101 Triangle Foundation Brush: A few months back I probably would have stayed well clear of a traingle foundation brush as the standard, flat brush did me well enough. Ever since I have learnt the benefits of the traingled version and opt for this more so than the original because the flat side is used as you would the previous to apply foundation to large areas and then the angled corners can make getting into precise areas easier than ever. This brush in particular soft with the synthetic bristles, feels extremely luxe to not only hold but on the face. The longer handles make application of foundation extremely easy plus the angled design means getting in hard to reach areas (think side of your nose and under your eye) so much easier. Honestly, I’ve been trying out my beauty blender and often use this for foundation application, but on the days I use a brush, I’ve been using this and love the results as it ensures application is even and natural. Using just the tip is also really good for covering blemishes! 100 Arched Powder Brush: This is SOO fluffy! It’s slightly smaller than the standard Powder Brush by Real Techniques but means you can really control where you apply the powder and not look caked which I found the other one did as with its larger size held more product. This is very self explanatory as you swirl is over your face or in the particular areas you want to set. I reach for this on a daily basis and would recommend this incredibly if you’re looking to expand your base brush collection. Tapered Blush Brush: What I love about this is how controlled your blush application becomes with the tampered sides if this luxe brush. This makes building up blusher extremely easy whilst avoiding looking like a clown (never a good look now, is it?) I’ve always spent a long time ensuring my blush is in the right areas of my face and the handle makes precision super easy because you have ultimate control whilst applying and blending out – perfect for a natural glow. 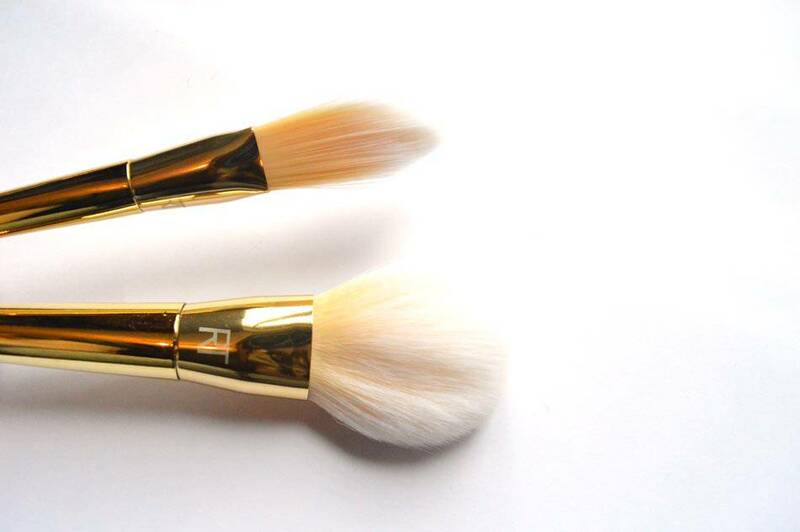 301 Flat Contour Brush: How I love contour brushes and this certainly does not dissapoint. I have tried this with both powder and cream contour kits and it works with both extremely well although my personal preference for everyday is a lighter, powder contour but it makes blending a dream. What is different about this brush is the shorter bristles which means you’re not going to end up with thicker contour lines streaking down your face that I often found a problem with their existing Sculpting Brush. You may worry the white bristles will stain but after proper cleaning, they returned to their clean state. They also allow you to see exactly how much product is on your brush to prevent you going OTT which is why I opt for these more than my black bristled brushes, especially when I’m in a rush and don’t have the time to rectify any mistakes I may make. Lastly, the silver brushes signify the eye brushes in the new collection. Quite frankly, these three brushes work together really well to complete any look you want to create. 202 Angled Liner Brush: This is hands down my most used eye brush if the set – the thin, stiff and short bristles make applying eyebrow products (such as a cream or powder based product) incredibly easy, especially with my naturally thin brows. I would say this replaces my Anastasia Beverly Hills #12 brush but what I love about that is the spooly on the other end – if they had a bold metal spooly, I’d be a total convert. #again the handle makes sculpting very precise meaning you can get an amazing arch in less time. I expect it works in just the same way with eyeliner. This is definitely the best brush for eyebrows/eyeliner on the high street/drugstore, and even though it may be pricey, it is SO worth investing in. 200 Oval Shadow Brush: The larger of the two shadow brushes above, I love using this to apply my transition shade all over my lid but could also double up as a concealer brush should you want a brush for precision application. I really don’t think you can have enough eyeshadow brushes in your collection and I know this won’t be my last. 201 Pointed Crease Brush: The bristles on this brush makes creating a smokey or winged look really easy due to its precise shape meaning you won’t end up looking like you’ve given yourself a black eye – which is never a good look, anyways. I often use this to apply the colour and use my Mac 217 to blend it all together – they make the perfect combo! These brushes were expensive, especially compared to the standard Real Technique lines but the quality is the same as Mac I have found, not all are worth the money (I’m sorry!) but those I use daily are so be sure to keep out for any offers available – I know Boots are always discounting them, the link to their website is attached to the name of each of the brushes. I’d recommend buying one or two and trying them out and ensuring you like using them before you splurge on the whole set but as a makeup enthusiast I could not resist. Real Techniques is going from strength to strength and I’m happy to be helping out other bloggers/vlogger (Sam and Nic Chapman) in building their wonderful brand. 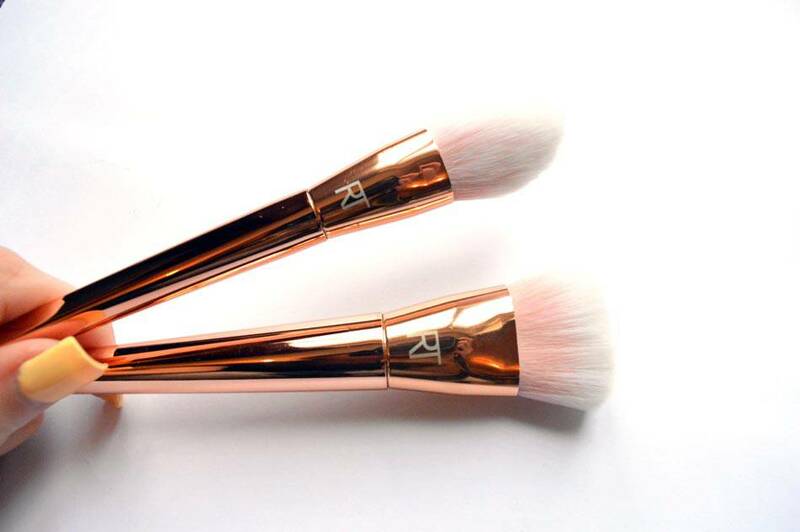 Have you tried any of these brushes or looking to splurge out on a few? Be sure to let me know! Review – Real Techniques Sculpting Set / Review – Real Techniques Stippling Brush / Review – Real Techniques Powder Brush. Next Post Battle of the… Blushes!